All of us would agree that to achieve a high level of success in any worthwhile goal requires that we stick with it and persevere. Perseverance can be difficult as we have discussed before, many obstacles can get in our way. 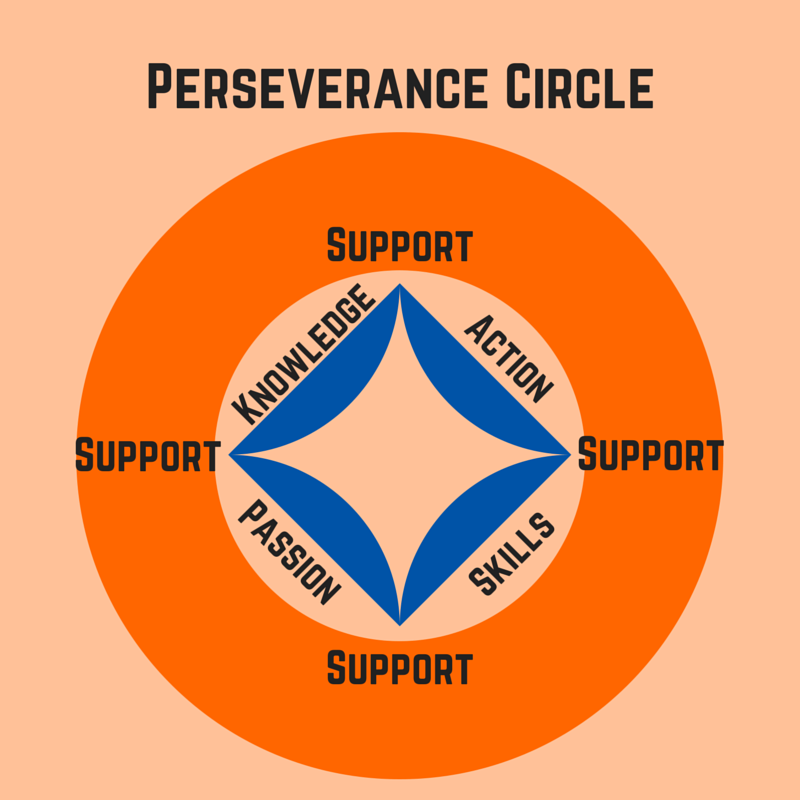 However the Perseverance Circle shows the importance both of support from others and our own actions. Lets say we have decided to take up a new activity, or we have found a cause that we feel strongly about. We get started learning a new skill, or we want to find a way to cure a disease. At first we are excited and put a lot of energy into the activity. We may make some progress, when support comes and encourages us to continue. As we continue we gain more knowledge and take more action by practicing our new skill. The more action we take the better our skills become. The better our skills become the more passionate we are and the more we want to learn and to do better. The more we learn the more we take action and practice. The more practice, our skills and passion grow from these new found skills. The circle is in motion, and with the support of friends and family every step of the way (knowledge, action, skills, passion) our perseverance pays off in success. Your personal success may be found in your home and family relationships, in your job or education, in a hobby that we have or in a service to your community. No matter where it is, it is likely that you had great support along the way and you stuck with it long enough to be good or even great at your new found skill. One final note on skills and passion for young adults (or even older folks). We hear people talk about what they will do for a career when they grow up and some will tell them to follow their passion. Then of course we might say I am not passionate about anything. If you have ever felt that way, start something that you can develop skills in and the better you get at the activity – your passion will grow and you may have just found a skill that may lead you to a career. But only if you have perseverance. All adults have goals and so do children. The child’s goal may not seem to have obstacles as large as our own – but they are obstacles nonetheless. Helping children reach their goals through perseverance may also require that we help them to understand 4 unseen obstacles that get in the way of both children and adults. Let’s begin with a goal a child may have of wanting to be able to ride a bike with their friends. At the moment though they do not know how to ride and they may be getting very discouraged about not being able to ride. The quick answer is – they need to practice. But there are four things that may block them, that we can help them understand and overcome. They have not set a date to reach their goal of riding their bike. Not setting a goal with a deadline can be a deterrent. There have been many times that children in our school who need to learn to jump rope – have only accomplished the skill the night before their demonstration. The fear of failure, or even of success. Fear is one of the main reasons that many do not reach their goal. For children and bike riding it may be fear of getting hurt, or not being as good as their friends. It may be fear of the amount of work required or the perseverance needed. In line with fear is also the looking in the past and believing we will have the same results. Skills that we tried to learn in the past that did not come easily or we gave up on may haunt us and those failures become our reality. If we hold onto those fears, we may resent not getting it quickly and be very ready to give up soon. Finally not staying focused, boredom, or losing site of what we want – to be able to ride our bikes with our friends, may keep us from reaching our goal. All of these require that we persevere. Perseverance is steady, goal-oriented persistence, despite challenges or obstacles. Helping our children to see how to use perseverance to overcome these common obstacles will be a great lesson for life. All of us want to be successful. Success means different things to different people. Therefore goals are different for every individual. Thinking of our goal and then working on it so that we can achieve it almost always requires that we find and use perseverance. Have you ever thought about success outside of “What do you want to be when you grow up?”. Helping our children see that they can control their destiny and empower them with the hope of being successful – in their own eyes will also help them to be happy. Beyond what they want to be when they grow up, they may also consider what success would look like in their future home and family. Do they want to live by the ocean or in a city? Do they want to have a family with children? They will need perseverance to meet those goals. How will success look in giving back to the community? Do they want to run for public office or be president one day? Would they like to work with animals or the environment? What would success look like in their impact on the community. They will need perseverance to meet those goals. How will success look in their hobbies and recreation? Do they want to learn to ride horses or fly fish? Would they like to be a pilot or design clothes? Whatever they choose to do for fun will help them feel successful. They will need perseverance to meet those goals. Showing our children how to stick with a goal will help them for the rest of their life. 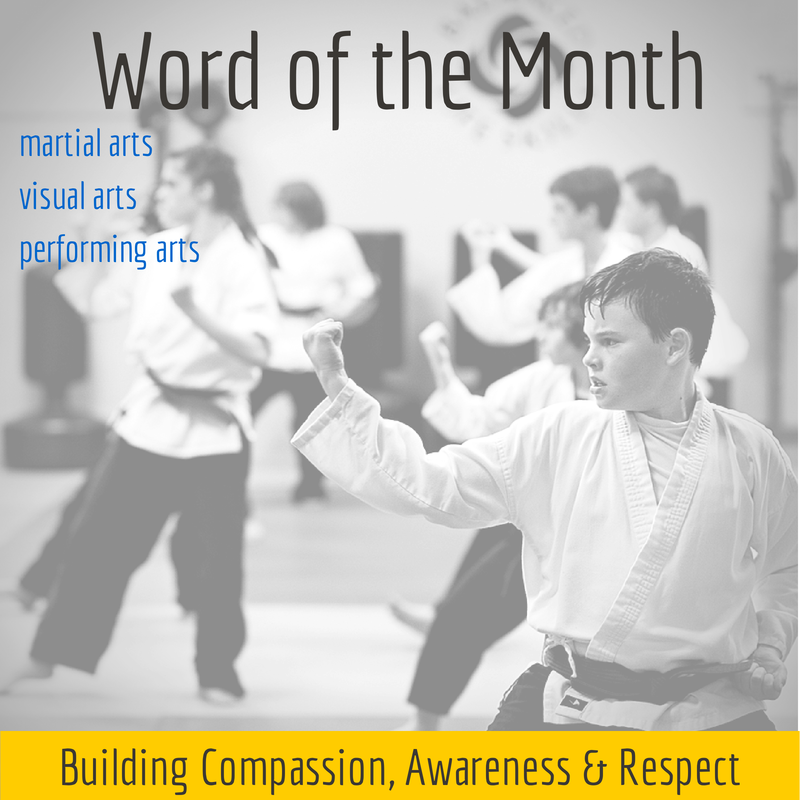 Each month we will discuss a life skill with all of our students. This month the word is Perseverance. This word will be defined in the following ways for our students. 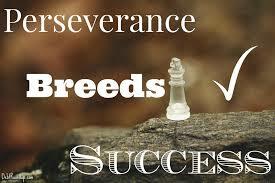 Young students: Perseverance means: When the work gets tough, I don’t give up! Older students: Perseverance means: Steady, goal-oriented persistence, despite challenges or obstacles. Each age group has a worksheet that parents can use to continue the discussion at home with their children, and one for adults to allow them to think more deeply about the skill and how it applies to them. Would you like to receive the worksheet? Stop by our studio at 133 Gibralter Avenue in Annapolis, MD and tell us the age of your child. We will give you a worksheet and invite you to watch Mr. Joe discuss the word with the students in class. You can also follow our discussions here on this website. If you would like to become a member of Balanced Life Skills, come TRY CLASSES FOR FREE. 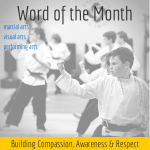 We are not your typical after school activity, in fact we are an education center, working with our students on physical skills along with empowering families with compassion, awareness and respect – creating a culture of peace – through the martial arts. We believe in every child and will build their confidence. Balanced Life Skills serves the community and encourages each student to do the same. When I first looked at the word for this month, Persistence, I wondered to myself – ‘what is the difference between persistence and perseverance?’ Both seem to be about reaching a goal and the goal not coming easy. Both require discipline, focus and determination. I thought about it for hours, trying to determine how to deal with this subject with our students. The first requirement for successfully reaching a goal is to have a goal, a purpose / mission that we are committed to and have a strong desire to reach. Once we have a goal or chief aim in our mind we must have perseverance, because there will be things that come up that will block the easy path to that goal. We may get sick, not have the financial resources. We may get hurt or other situations may arise outside our realm of control that could easily make us believe that we cannot continue. It may seem that it is just not ‘meant to be’ due to these circumstances or events and therefore easy to give up. Perseverance is not allowing these outside forces dissuade us from pursuing our mission or specific goal. 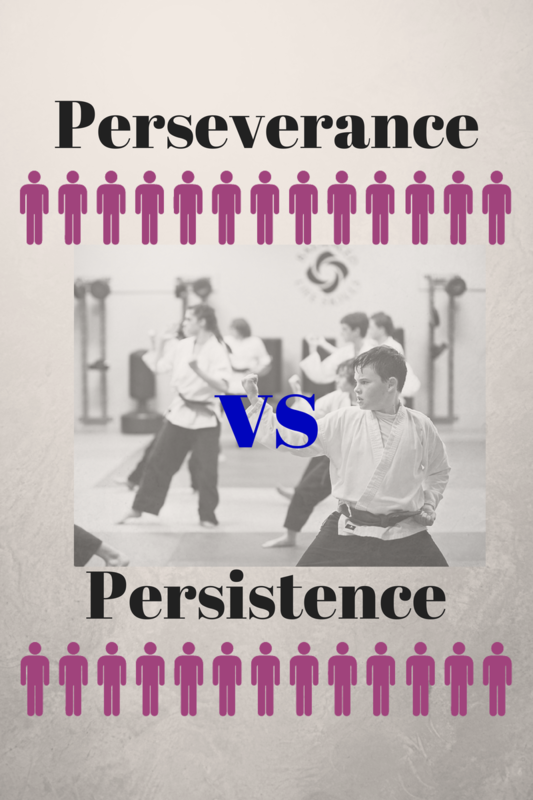 Persistence is also needed but is far more internal. We may have a goal in mind that we believe in and want to accomplish, that while may be possible, may also be very difficult or require more time, energy or creativity than we expected. Persistence is the quality that keeps us going, even when others have given up. It is reexamining our motives and desires and pressing forward – to find the answer or accomplish the goal. Our desire is so strong that when one way of approaching the challenge does not work we do not give up – rather we look at it from a different point of view. Our desire to reach the goal continues to drive us even if the process become monotonous or even boring. Our internal drive does not stop. There are times when perseverance and persistence no longer make sense and we need to adjust our goal in some manner. Most of the time though both of these character traits will help us accomplish our mission or purpose when put into practice in a balanced manner. In 13 (short) weeks, I will be competing — and I use that term loosely — with a team in the Mid-Atlantic Tough Mudder Event. To give an overview of the obstacles I am committed to overcoming, I will submerge and swim through an ice tank, crawl through narrow, sloping pipes leading into frigid mud, slither under low-hanging live wires waiting to electrocute, leap over 4-foot high hurdles of kerosene flames, and so, so much more across the distance of 12 miles! Why go through with this? Besides wanting to challenge myself and test my physical limits, the Tough Mudder raises awareness and funds for theWounded Warrior Project. This project is focused on reintegrating injured soldiers into society, and active lifestyles, with their programs. If you are interested and able, please support me in the Tough Mudder event, on September 8th, by donating online here. The proceeds raised will assist many individuals and families struggling to deal with the injuries received in the line of duty. You contribution is greatly appreciated!